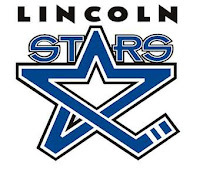 Fargo d-man Brian Cooper's third period goal with only 3:55 remaining was all the Force would need Friday night to beat the visiting Lincoln Stars in game one of their best-of-three opening round USHL playoff series. Fargo would add an empty net goal with 49 seconds left in the game to complete the shutout at 2-0. Click here to view the Poinstreak boxscore. With the loss, the Stars must now win the last two games in this series otherwise the season will be over for the black and blue. The story of this game was the play of the two starting goaltenders: Ryan Massa of the Force, and Kevin Murdock of the Stars. Both teams came out very strong in the first period, and both netminders were up to the task. Massa stopped 14 shots on goal in the first, while Murdock stopped 15 shots on net in the first. Both goaltenders made some huge saves in the first twenty minutes, and throughout the game, but it was a fluke third-period goal by Force defenseman Brian Cooper which got past Murdock to give Fargo the game one victory. Fargo out-shot the Stars overall, 31-23. Stars went 0-for-3 on the powerplay, while Fargo went 0-4 with the man advantage. Murdock stopped 29 of 30 shots in the loss, while Massa stopped all 24 shots in the win. Give credit to the Force for clamping down in the second and third periods, limiting the amount of Lincoln scoring chances, and playing sound defensive hockey. As I stated above, the Stars were able to put 14 shots on goal in the first period. However, Lincoln was only able to put 9 shots on goal in the second and third period combined. 9 shots on goal in 40 minutes of play isn't going to win you any hockey games. Also a little concerning is the play of the Stars' powerplay unit. After going most of the regular season with the top PP unit in the whole USHL, the Stars are 0-for-18 on the PP going back the last five games. Not a good time for the PP success to dry up. Time to bring out all the tired, worn-out sports cliches. It's do or die time. Their backs are against the wall. Take it one game at a time. They have to find a way to put the puck in the net. They're on the ropes. Time to circle the wagons. However you say it, the Stars know what they must do to get to the second round. Win tonight, and win tomorrow night. Simple as that. We will be doing another live in-game chat for the game tonight, so make sure you drop by and check us out. We had a good turnout last night, and I hope to see even more tonight. Hope to see you all there.